I set out to find the best drone videos I could for the cities on our website and discovered some seriously amazing ones. While some of these are filmed by amateurs, the quality is right up there with some of the best videography I have seen. We even threw in a few extras from places we don’t cover, as they were simply too good to leave out. Enjoy! This video was filmed at English Bay in Vancouver using a DJI Phantom by Amiel De Guzman who has produced some of the best quadcopter videos I have seen of the Vancouver Area. The videos are well edited and stable. This video rivals some of the best tourism videos out there except for a small mishap with a tree at the end. Here is another outstanding video filmed by Amiel De Guzman using his DJI Phantom in the area around False Creek and Yaletown. He also adds some human interest with the skateboarders. You will see several popular attractions in this video including Science World, BC Place Stadium, Rogers Arena and, in the distance, Vancouver Lookout. There are also some nice shots of the SkyTrain. 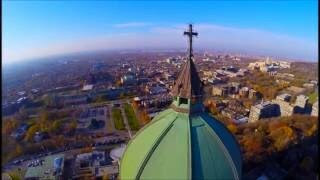 You’ll spot many of Toronto’s top attractions in this superb video filmed with a DJI Phantom 2 and a GoPro Hero 3 camera. The video is actually a compilation which includes not only some great aerial footage, but also some footage from the ground and water. See how many Toronto attractions you can spot. Okay, we must admit that their were some serious safety rules broken to capture the CN Tower so spectacularly from this altitude with a drone. We certainly don’t advocate this kind of flying with any drone and hopefully the operators will be more responsible and stay safe so as not to spoil it for everyone. Here is yet another great video showing off many of Toronto’s top landmarks and attractions including High Park, Nathan Phillips Square with both the Old and the New City Hall, Roy Thomson Hall, the Roundhouse and the Toronto Harbourfront district. Many visitors to Toronto like to take a day trip out to see the world famous Niagara Falls, but even that won’t give you the incredible views of the falls that can only be obtained with a drone as you will see in this video. The lighting, editing, filming and subject matter of this video leave it difficult to find a superlative that can do it justice. The thing that really stands out in this superb drone video taken in both Montreal and Quebec City are the spectacular fall colours. If you’ve never experienced the eastern portions of Canada or the USA during the fall, this video will give you an idea of what you are missing. You’ll spot many top landmarks and attractions as well. This amazing drone video is expertly done and captures many spectacular scenes and attractions from around all five Boroughs of New York City. This must see video is the best overall compilation of the NYC area that we have seen. Go along for a night flight over the streets of Paris in this video filmed from a homemade drone. This video of Château de Versailles in Paris was professionally made by Freeway Drone and it shows. You’ll enjoy seeing the amazing architectural detail in this drone video that doesn’t just give you an overview, but gets you up close to this famous landmark. Also filmed by Freeway Drone, this video of Le Mont Saint Michel which can be visited in a day trip from Paris is equally stunning and even takes you through the inside. Before you email me, I know this is not a drone video, but I could not resist including this Eagle Cam video in which an eagle takes to the sky from the Eiffel Tower and shortly homes in on its trainer waiting below in the Jardin du Trocadero. Amazing how quickly the eagle can pick its trainer out from all those people. On to the beautiful city of Rio de Janeiro, here we have a nice video that explores the Rodrigo de Freitas Lagoon and Ipanema area. There is a very nice dusk scene just before the the end. Team Black Sheep gives you a very up close look at one of the Favela’s that line the steep hillsides of Rio. It’s a view that one rarely sees and shows just how dense and haphazard these poor communities that exist throughout the city are. The video also has some nice shots of the gondola going up to the top of Sugarloaf and also of the Santa Teresa area. This video, also by Team Black Sheep, uses not only drones, but also a radio controlled flying wing known as a Zeph (short for Zephyr) to take you on what is sometimes a pretty wild ride around many well known locations throughout the beautiful city of Rio de Janeiro. You’d better hang on to your hat while watching some of the spectacular scenery in this amazing video. Beijing is not one of the cities we cover on, but this video was too good to pass up. The individual who filmed it go into some legal trouble with the Chinese authorities for his trouble, but all ended well and was able to share this truly spectacular video with the rest of the world. Imagine seeing a fireworks show from the middle of the fireworks themselves. The person who filmed this video during a fireworks display in Florida wanted to do more than imagine what that would be like so he risked sending his drone up into the display resulting in this previously unseen perspective of a fireworks show from. Amazingly his drone survived the experience unscathed. Pretty lucky I’d say. And finally we have this breathtaking video, once again by Freeway Drone, showcasing absolutely jaw dropping scenes from around the world filmed by drones and compiled into this three minute video that you’ll want to watch over and over.